We also offer for sale works of well established masters. All items are readily available, and some can be rented. Original lithography on paper, nicely framed. Signed and numbered (12/125) by Roger SOMVILLE (born in 1923). 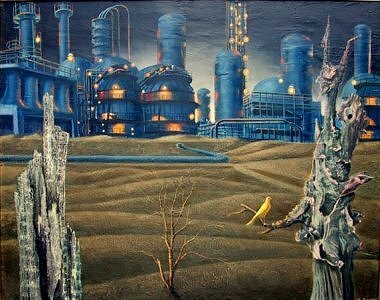 "Refinery of my dreams". Oil on panel, framed. Signed and dated (1964) by Robert GEENENS (1896 - 1976). Price : on request. More works available, please contact us. No title. 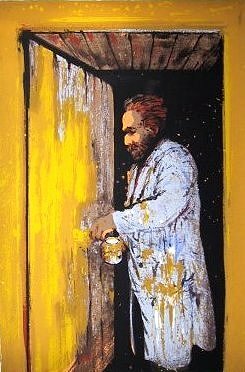 Vincent painting his door while waiting for Paul? 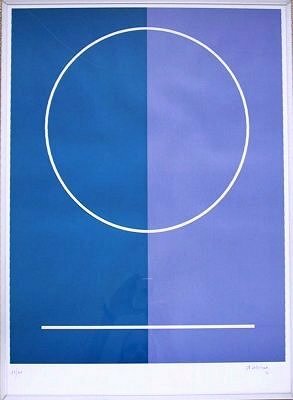 Original serigraphy on paper, signed, and numbered 75/150 by Hugo HEYRMAN (born 1942). Hand-coloured original etching on paper, framed. Signed and numbered (10/30) by Roland DEVOLDER (born 1938). 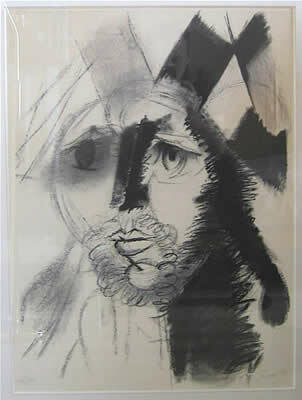 Monotype (1 original only) on paper, framed. Signed, titled and dated (1962) by André GOEZU (born 1939). Price : on request. More works available, please contact us. "Untitled". 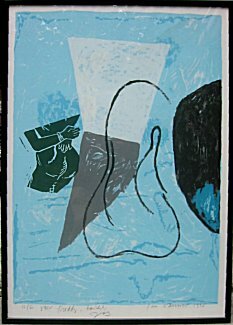 Original serigraphy, signed, dated (1982) and numbered 13/100 by Jo DELAHAUT (1911 - 1992). 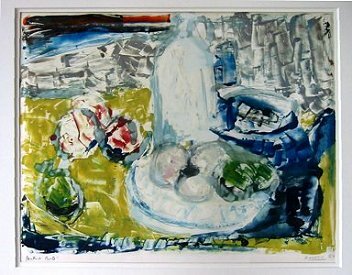 Original lithograph on paper, numbered (13/50), dated (1996), dedicated to Freddy De Vree and signed by Jan VANRIET (born 1948). 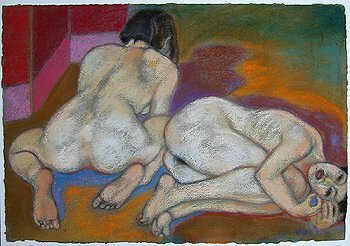 Pastel on paper, framed. Signed by Michael BASTOW (born in GB, 1943). Dimensions: 32 x 48 cm (h x w), framed. Other works (definitely more explicit) available by this artist. Please contact us. 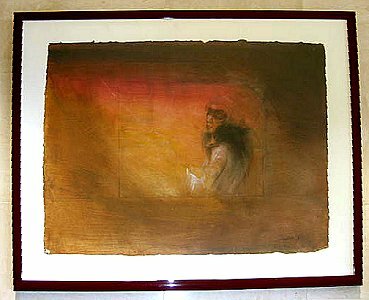 "The Painter and his Model"
Dimensions: 48 x 32 cm (h x w), framed. Watercolour on paper. Dedicated to Freddy De Vree and signed by Michael BASTOW (born in GB, 1943). Dimensions: 33 x 50 cm (h x w), framed. Original xylograph on paper. Dedicated to Freddy De Vree, numbered (74/75) and signed by Michael BASTOW (born in GB, 1943). Dimensions: 50 x 65 cm (paper) resp. 30 x 40 cm (image). 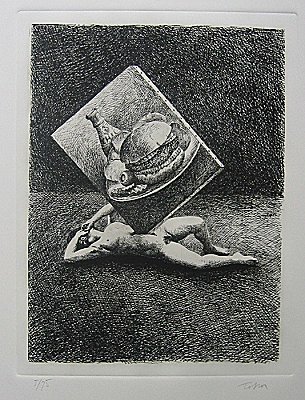 "Junk-hunger" (1973) - Original etching on paper. Signed and numbered (5/75) by Roland TOPOR (1938-1997). Dimensions: 52 x 35.5 cm (h x w)(paper) resp. 32 x 24 cm (image). This work is included in an elegant black-plexi box (55 x 39 x 5 cm) containing also 4 deluxe drawings (reproductions) by Topor and 25 poems in Dutch by Freddy de Vree titled "Alsof zij niets was", with the author's signature. A sumptuous, limited (85 ex.) edition. Don't miss our young and mature talents on the other pages of this site. They represent the future, to be chosen in the present! See also our Modern Masters.